The next item on the U.S. Forest Service agenda is the future of Kruzof Island. Decisions are being made regarding future timber operations, upkeep of cabins, shelters & trails, changes to stream & river management. These are decisions that will affect the ecosystems of Kruzof Island, all the myriad animals that depend on those ecosystems, and us: the Sitkans who depend on Kruzof for its excellent hunting. fishing. hiking, bear viewing, camping and more. The Forest Service will go ahead and decide the fate of Kruzof how they see fit, unless each of us speaks up and lets them know how much we value Kruzof and its future. Tell the Forest Service how you want to see the future of Kruzof shaped. Contact the Sitka District Ranger Carol Goularte and let her know that Sitkans want to be included in planning the future of Kruzof! 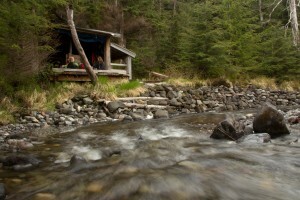 The Starrigavan Creek Cabin is not only the most popular cabin in the Tongass National Forest, it’s also a tangible example of how sustainable second growth timber harvest can be utilized. Who needs old growth harvests when such beautiful things can be built with sustainable second growth? Even building the cabin was a learning experience! This beautiful cabin was constructed as a part of University of Alaska Southeast’s two-week log home building course. Check out a video about the building process here. More important than being an example of the use of second growth timber, the Starrigavan Creek Cabin is a great place for family and friends to get out and explore the Starrigavan Recreation Area. There’s a reason this cabin is the more frequently used in all of the Tongass National Forests – great times and great memories to be made! Helen worked for two summers with SCS on wild salmon education and outreach programs and advocacy. She’s currently pursuing a Masters of Regional Planning at Cornell University, focusing on sustainable food systems, and working for Sitka Salmon Shares. As a Midwesterner, I enjoy meeting and learning from local farmers committed to producing quality food in sustainable ways. In college I loved crafting meals at home, experimenting with new vegetables from my parents’ Community Supported Agriculture share. Yet for all my excitement, I rarely thought about food systems beyond the Midwest. That changed when I moved to Sitka, a fishing town build on salmon, nestled within the Tongass National Forest. There I ate pan-seared king salmon—straight from the docks—at the home of a fisherman friend, with sautéed greens harvested from the backyard. I learned quickly that, in this community, the sustainability of local food means something very different than what I knew in the Midwest. The health of the Forest relates intimately to the strength of the wild salmon runs that make Sitka one of the greatest premium ports in the country. Walking through the forest, along the docks, and through the processor, you see how salmon connects the environment, culture, and economy—and the central importance of Alaska’s sustainable fishery management to ensuring these relationships continue. Returning home to the Midwest, I was excited to share this salmon and its story. From my work with Nic Mink at the Sitka Conservation Society, I helped him establish Sitka Salmon Shares, the first Community Supported Fishery in the Midwest. We link fishermen we knew in Sitka with friends and neighbors in cities like Minneapolis—folks who crave the best salmon, but want the trust, transparency, and quality they currently seek from their farmers. As part of Sitka Salmon Shares, we collaborated this fall with the Campus Club at the University of Minnesota to hold a Tongass salmon dinner. Chef Beth Jones used produce from the University’s campus farm, crafting a sweet corn succotash and a heirloom tomato relish to accent the unique flavors of coho, king, and sockeye from our fishermen in SE Alaska. The guests that evening, however, wanted more than a nourishing meal that celebrates small-scale, sustainable food and its producers. They wanted to understand the significance of the wilderness and watersheds that give life to the salmon. Nic gave a talk called “How Alaska’s Salmon Became Wild,” exploring the histories of farmed and wild salmon. Afterwards, we invited guests to join us in asking the U.S. Forest Service to design their budget to reflect the importance of salmon and their habitat within the Tongass. In return, SCS and fisherman Marsh Skeele thanked them with one pound fillets of troll-caught Tongass coho. The enthusiasm that our guests had to take part in this effort illustrated the important role food can play in forging connections. 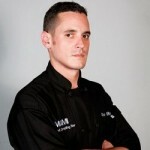 I support eating locally, but we should not forget the power that emerges when we form strong connections across regions. Our dinner at the Campus Club revealed that by starting with the allure of a boat to plate meal, we can show how the process really begins in the forest. From Sitka to Minneapolis, the value of the Tongass and its salmon holds true. How do YOU think our forests and watersheds should be managed? We want to know your thoughts and ideas about how our forests and watersheds should be managed! Do you kayak in Silver Bay? Hike along Indian River? Hunt on Kruzof? These are the places you know and love: how do you want to see them managed? How do you think restoration and management should be prioritized? Your input matters! The information we gather from this survey will help guide our work. Please fill out our short 5 minute survey online or using the insert in Friday’s issue of the Sitka Sentinel. Paper surveys can be dropped off at the SCS office, 4J’s, the Highliner, or Kruz-off Espresso. Thanks! For the last two weeks I have stood in my shower cherishing every moment because I knew it wasn’t October yet. But September has passed and October will bring lots of rain, or so every Sitkan has warned me of, and new changes in the Jesuit Volunteer House. We have decided to take challenges every month to live a more simple and sustainable lifestyle. For our community, that means being mindful of the way we live. We want to leave the smallest footprint on our world and live in a manner that uses fewer resources. We begin this challenge by looking at our water consumption. Many ideas were tossed around for this water theme, but the one that stuck was bucket showers. It is in part to see if we could all accomplish this, but most importantly it is about forcing us to really think about our personal consumption and be more aware of the choices we make when consuming water. My interest in water consumption began in college when I learned that the majority of the world does not have access to water like we do. Many countries can’t turn on a faucet and have clean running water. I thought I understood and appreciated this. I would always make sure to turn off the water when I wasn’t using it, but never had I thought about how much I was potentially wasting in the shower. I started looking at my own water usage, but not enough for me to really change my showering habits, not until now. I needed the support of a community who was willing to not only bucket shower with me, but keep me motivated to continue. I started timing my showers in September to see how many minutes a typical shower lasts. We had no way of determining how many gallons of water we were using during a shower, so we based everything off time. My showers averaged out to be seven minutes, which I would consider a fairly short shower, but I knew that bucket showering would take considerably less time. This morning I found out how short it was. One minute and forty five seconds was the time it took to fill up one kitchen bucket. It only took one bucket to do the same thing that seven minutes of running water takes. Was it pleasant? No, not really. It was cold and kind of uncomfortable, but that was the point. We are trying to push ourselves to feel a little more uncomfortable to understand how to live more simply and sustainably. Water availability is probably not on the forefront of everyone’s mind in one of the wettest climates in the world, but it’s been on mine. What if every person in Sitka decided to flush their toilet one less time a day, turned off the water when they brushed their teeth, or took a shorter shower? What if every person did just one thing every day to conserve a little water? Think of how much that could be when 8,950 people decide to conserve just a little more than usual. Think of how many thousands of gallons of water we, as a community, could conserve together every day. Could everyone make themselves a little more uncomfortable one time a day? The Jesuit Volunteer House has promised 31 days worth of bucket showers to limit our water consumption. What if the entire community would take the challenge with us? Think of the possibilities. Stay tuned for updates. 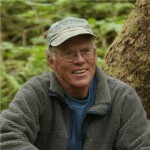 “In Sitka we, as a community, have an outstanding opportunity to have a strong relationship with the food we eat. We touch fish with our hands and get to transform it into a meal to fuel our bodies, and that is something to be celebrated. Fish to Schools is a project that has been created to provide a healthy and local option to the school lunch menu and allow kids to explore all dimensions of their food: where does it comes from, what does it look like, and why is it so important. Students are able to go look at fishing boats, dissect a salmon, and learn how to prepare the food they catch. It’s time to ask questions about where our food comes from. And it’s time to care about the answer. Kids will learn that the banana they ate for breakfast traveled thousands of miles to reach their doorstep and the lunch they ate at school came from Alaskan fisherman. Let’s cut the fish open. Let’s explore and investigate what we are putting in our bodies. Let’s treat our body well and see what comes of it. Subsistence fishing has always been a way of life in rural Alaska. Thanks to the foresight of the generation of Alaskans that achieved statehood and wrote our great constitution, the right of subsistence for all people, regardless of ethnicity, has been preserved across Alaska. Alaska Natives have been able to continue the way of life they have lead for 10,000 years, just as the pioneers who settled in this state were allowed to continue living off the land and the resources it provided, and new-comers to the state have been able to live off the land like those who came before them. The subsistence way of life and traditional subsistence practices are threatened by the privatization of key subsistence areas and resources. 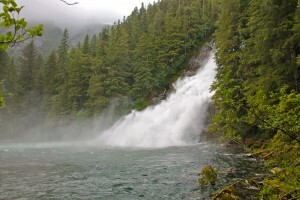 One of the most threatened places is Redoubt Falls near Sitka, where Alaskans harvest sockeye and coho salmon to fill their freezers and feed their families throughout the long winter. To really understand how important subsistence is to Alaskans and the Alaskan way of life – and to understand why we need to fight to preserve these rights – listen to the segment from Richard Nelson‘s radio program “Encounters” in which he fishes for sockeye at Redoubt Falls. 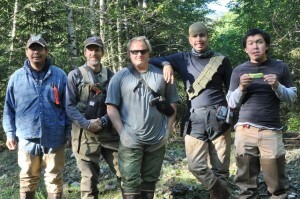 Surveying salmon streams on the Tongass National Forest is no easy task – it involves lugging heavy survey gear, tripods, marking stakes, and other gear through dense young growth forests and wading up to our hips in frigid water. 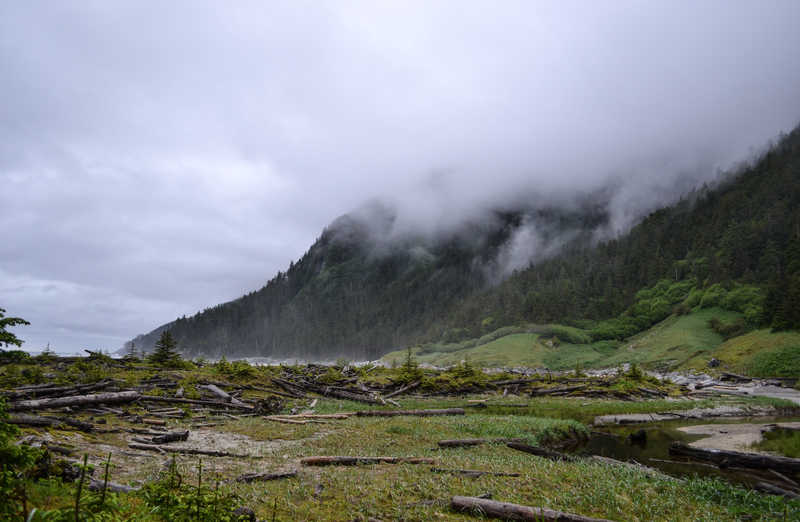 Last month, Scott Harris, Watershed Program Manager for the Sitka Conservation Society, worked with the Angoon Community Association Watershed Crew to survey recently completed restoration work on the Sitkoh River. After three days of survey work, Watershed Crew Supervisor Calvin Washington mentioned “this is a great project, I want to continue seeing what happens here…”. Restoring habitat is a worthy ideal, but restoring our connection to the land and inspiring a sense of long-term stewardship is equally, if not more, important. 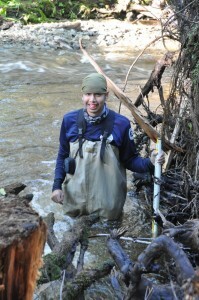 Calvin is the crew leader of the Angoon Community Association Watershed Crew. His crew joined SCS’s Restoration Coordinator Scott Harris and Groundtruthing leader Bob Christensen recently to survey the Sitkoh River. 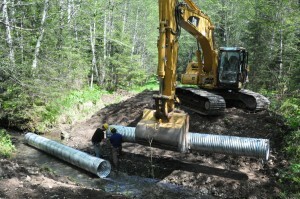 The Sitka Conservation Society developed a restoration partnership with Trout Unlimited, the Sitka Ranger District, and the Sustainable Salmon Fund to restore a section of Sitkoh River that was flowing down an old logging road. The construction phase is now complete and the longer-term effort of monitoring the effectiveness of the project has begun. This is where the Angoon Crew comes in. None of the three crew members had ever been to Sitkoh River, also called L’ukheenak’u (Coho Salmon Little Creek) by the people of Angoon. Our crew conducted habitat assessments, surveyed the completed restoration project, and just became familiar with the landscape. Rivers are dynamic, and this crew will return next summer to continue monitoring work and see what has changed. Soon they may even claim to be the new stewards of Sitkoh River! Bring out your kid’s wild side this Halloween by dressing them up for the Sitka Conservation Society’s Tongass-Inspired Halloween Contest. SCS folks will be awaitin’ outside the bookstore to find the costume with the best Tongass theme. Prizes include a $20 gift certificate from Old Harbor Books, ice cream coupons from Harry Race, water bottles, dried fruit, and more! For questions, contact Ray Friedlander at 747-7509.